Located in Toronto's creative and artistic center, the Gladstone Hotel offers a boutique hotel experience like none other. The concept of the Gladstone revolves around it's role in putting travelers and locals alike in touch with the local creative design scene, providing exhibition and event spaces in addition to lodgings. To up the ante, the Gladstone then immerses you in 100% unique artist appointed rooms that push the limits of traditional interior design. One such artist is Day Milman, a Toronto based artist and video-maker, who commissioned us to print her room's custom wallpaper. Milman was focused on sharing the historical side of the hotel, and it's connection with the locals who frequented there. She used archival photographs to create detailed line drawings of the hotel as well as it's guests and workers in various social situations. She then contacted us at Great Wall, to take her drawings and arrange them into a classic toile wallpaper pattern. Whereas traditional toile wallpaper has pastoral scenes of the countryside aristocracy, Milman's updated toile celebrates the hotel's specific history, while still utilizing a standard blue and off-white palate. We took her incredible drawings, scanned them, and then laid them out in the toile pattern while also establishing the pattern repeat. You can learn more about Milman's process and the room itself here. Insofar as custom wallpaper projects go, this was a very clever way of reinventing a classic for all the right reasons, and executed in just the right way. 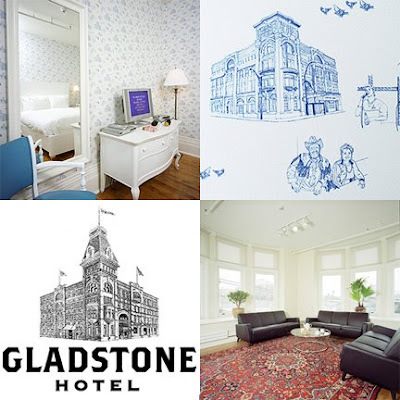 The next time you're in Toronto, make sure your trip includes a visit to the Gladstone Hotel. To have a custom wallpaper installation in your home, contact us via our website to begin the process.